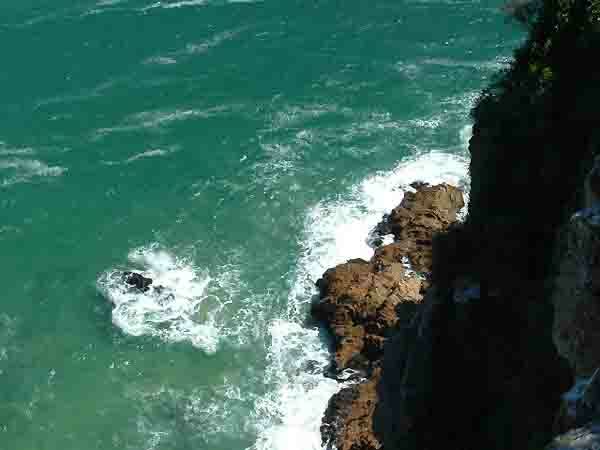 Knysna another prime holiday destination along the Garden Route was established way back in 1804 when George Rex who was rumoured to be the illegitimate son of King George III bought the farm Melkhout on the banks of the lagoon and moved there with his family. The lagoon which stretches for miles inland is tidal, and has the sea entering it through two sandstone cliffs called the Knysna Heads. In between the heads is a deep channel which is navigable for small ships. Any mariner entering the Heads has to be on his guard as a small deviation from course can result in his ship running aground on the treacherous rocks which lie just below the surface of the water near the entrance of the channel into the lagoon. The Heads of sandstone are quite spectacular with their sheer cliffs facing seawards. On the eastern head many houses with spectacular views over the lagoon have been built. 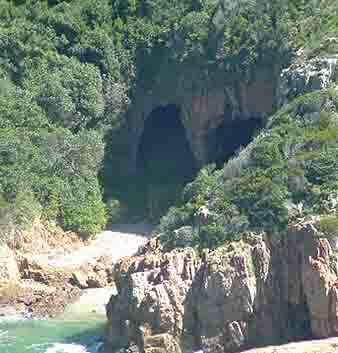 Along the edge of the cliffs the Knysna authorities have built wooden walkways and lookout points for visitors to use. Some of the lookout points hang precariously over the edge of the sheer cliffs and one can look down onto the sea and rocks far below. If you don't have a head for heights this is somewhere you should not venture. The western head is owned by the “Smiths” who utilise the ground as the Featherbed Nature Reserve. Their forefather Professor JLT Smith discovered the first “ Coelecanth” in South African waters. On the Featherbed side of the lagoon are a number of caves which have been hollowed out by the sea over the years. The caves on the Featherbed side of the lagoon. When visiting the nature reserve visitors are taken to the top of the head and then walk back along a rocky pathway and are able explore them. At high tide the sea breaks into them. 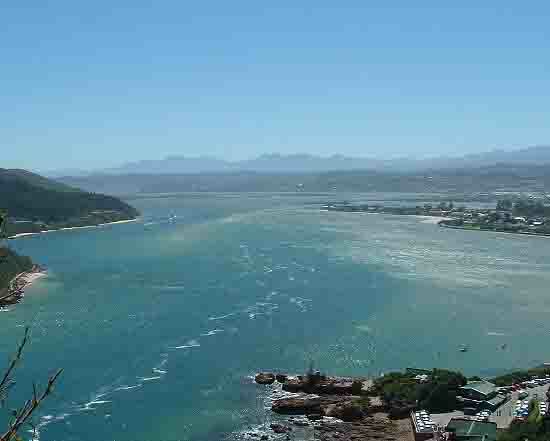 Knysna has a great deal of history attached to it and most of it surrounds the lagoon. 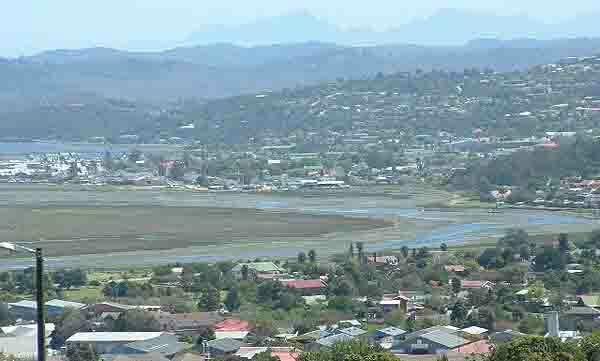 Thesens island which used to be an export harbour for timber from the forests surrounding Knysna has been turned into a residential area. Before the second world war there was a whaling station in the lagoon and one of the whalers was capsized by the Thesens ferry. 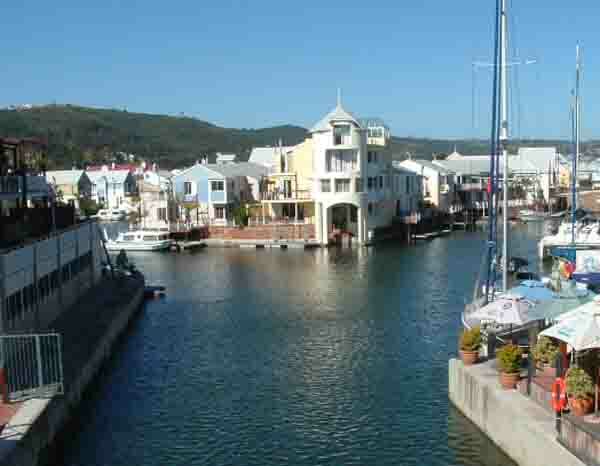 The small boat harbour near the Knysna railway station has been turned into a Marina and has a lovely waterfront area filled with shops and restaurants. There are canals in the harbour area with residential buildings built right to the waters edge. Instead of parking your car outside your bedroom window you can park your boat. Every year Knysna hosts an oyster festival and with it a fun run and a bicycle race for all comers. People come from far and wide to participate and enjoy the oysters which are on offer. Why not join them at this gem of a holiday destination on our coastline.